The Sefarina, a seagoing ship operated by the Dutch company Chemgas Shipping, has scored another "first" in the port of Antwerp. After being the first ship to obtain a particulates discount, on Monday it was also the first seagoing vessel to be bunkered with LNG in the port of Antwerp. 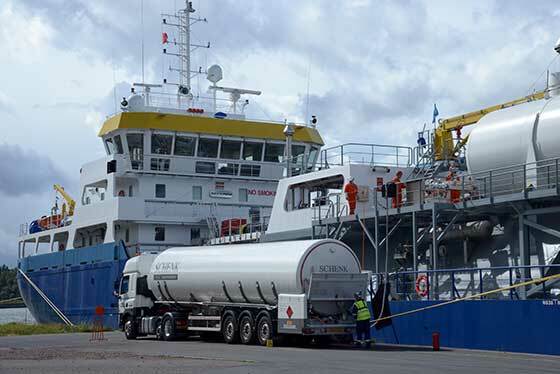 Bunkering with this cleaner type of fuel has already been possible in Antwerp for some time, but so far it has been used only for barges, with the LNG being supplied by trucks. The recent truck-to-ship bunkering of the Sefarina now counts as a test case for the safety procedures that will apply to bunkering of seagoing ships. LNG bunkering in the port of Antwerp has been available since 2012. A truck collects LNG at the LNG import terminal in Zeebrugge and brings it to the quay in Antwerp where it is pumped into the ship, a procedure known as truck-to-ship bunkering. LNG is a much cleaner fuel in comparison to diesel. The exhaust from a ship driven by LNG contains hardly any particulates, while emissions of NOx are also dramatically lower. As part of its sustainability policy Antwerp Port Authority aims not only to encourage the use of LNG as ship's fuel but also to facilitate it. The Port Authority therefore seeks a candidate to build and operate an LNG bunkering and filling station under a concession on quay 528. The aim is for barges to be able to bunker with LNG in the port of Antwerp at a permanent facility by the beginning of 2019 at the latest.